Longstanding nonprofit recognized for its senior living, health and wellness and philanthropy services for older adults. It’s both an honor and a privilege to be recognized by our business peers for Sun Health’s commitment and accomplishments in 2015. Sun Health has been a health care leader and mainstay in the communities that make up the Northwest Valley since 1970. It's also one of the area's largest employers. 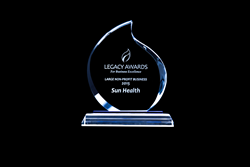 The Surprise Regional Chamber of Commerce recognized these accomplishments by presenting Sun Health with a Legacy Award for Business Excellence at the chamber's annual Legacy Awards luncheon, held Feb. 26 at Grandview Terrace in Sun City West. Sun Health won the award in the "Large Nonprofit” category. The luncheon drew more than 120 guests representing businesses and organizations of all shapes and sizes that keep the Northwest Valley economy humming. Sun Health faced tough competition from several other “large nonprofit” nominees, including Adelante Health Care, Banner Olive Branch Senior Center and the Recreation Centers of Sun City West. “It’s both an honor and a privilege to be recognized by our business peers for Sun Health’s commitment and accomplishments in 2015. We are truly grateful for this recognition,” said Sun Health Chief Marketing Officer Ron Austerlade. A long-standing champion of healthy living and superior health care, Sun Health is a community-based nonprofit providing pathways to population health through philanthropy, senior living programs and communities, and community wellness programs and services. For nearly 50 years, Sun Health Foundation donors have supported superior health care in the West Valley. The foundation is the philanthropic partner to Banner Boswell and Banner Del E. Webb medical centers and the Banner Sun Health Research Institute, as well as community wellness programs provided by Sun Health.